The sun is going to rise in a little while, and rather than inviting us outside, will be daring us to see how long we can remain in her company. We will see each other in brief spurts today, for I do better with relationships when the intensity knob is not always set on ‘high’. Lately she’s been giving me a lot of heat, taking my sweat and blistering my flowers. I think that gorgeous orb has a bone to pick with us and she’s making sure we know it. For those of you who are spending your Saturdays with this uncensored communique from the sun, I hope your day includes cool air, wonderful music, maybe a good read and a nap, laughter and love..always love. Posted on July 7, 2012 by mimijk •	This entry was posted in friendship, humor, life lessons and tagged Saturday. Bookmark the permalink. I think you are ox-ceptional…you are exceptional at doing two contradictory things simultaneously! yeah…i like your word better. you are SOOO good at making up words! Hi Kyle…You two great minds think a like..I’m happy you still liked the post, despite the alluring title. I will defer to you and Rhonda to keep the truly alluring coming (no pun intended?).. I hope my day *does* include your entire list. Have a good one Mimi. You too…I tried to download a song (Maroon 5’s Sunday Morning, even though it’s Saturday it felt right) – but I’m still learning how many ways I can screw that up. It’s a good day to learn something new..Please ask Endomondo to ease up a little bit while beating up the pavement today. Your Saturday plan sounds perfectly delightful, Mimi. I’m going to take this prescription and implement in toto. :-). Wishing you a lazy, loving summer Saturday as well…. P.S. 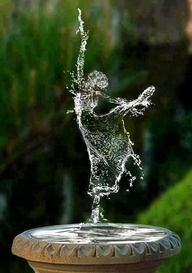 maybe this is a Rorschach test, but am I the only one who sees a beautiful, graceful lady pirouetting in the fountain? You really need to take a trip to wine country in Northern California during these East coast hot spells, it would be a nice change for you….wishing you coolness and peace for your Saturday Mimi!